I have no idea who I will be voting for yet, as the presidential candidates make their way through the early primary states. But I do know who I will not be voting for: Fred Thompson. Fred Thompson wants the government to keep its hands off your dinner plate. That’s what he told a questioner Tuesday in South Carolina, anyway. Standing about 15 feet away from a mouth-watering steam tray buffet loaded with fried chicken, creamed corn and macaroni and cheese at Wade’s Southern Cooking in Spartanburg, Thompson dismissed the idea that preventative care and wellness education should be central features of a government’s health care system. “I’m telling you, I don’t think that it’s the primary responsibility of the federal government to tell you what to eat,” Thompson said to applause when asked if his health care plan included any details on preventative care, a priority for Democratic candidates. Thompson, ever a fan of small government, said healthy living should be the responsibilities of families first. Since when is preventive care and health promotion a partisan issue? Can he not see that helping people get healthier will save government health care costs down the road? Will somebody please tell him about social marketing? At least Thompson understands that knowledge is not sufficient for bringing about change, but he needs to be educated about the many federally funded programs that are “instilling will power” and resulting in healthier, more productive and less health care-utilizing citizens. He’s right that families are the first line of defense in building a healthy lifestyle, but many people do not have the knowledge or skills to make it happen on their own. I hate to think what would happen to the CDC with him in charge. I’m glad that a left-wing socialist like yourself doesn’t support a consistent conservative like Fred Thompson: I’d be worried if you did! We do not need the government meddling in our lives…read the constitution and the Federalist Papers sometime! Wow – I didn’t know I was a left-wing socialist. Thanks for letting me know, anonymous person who has never met me. There’s a difference between the government “meddling in your life” and providing information and motivation for you to make your own healthy lifestyle decisions. Last I looked, that wasn’t prohibited anywhere in the Constitution. Whoa! Stay in your shoes. You are reacting to the author’s (CNN, no less) interpretation of what Fred said. I think Fred’s points indicate that he understands human nature: individuals have different expectations about their own health and behavior. Patient motivation comes from within based on a variety of factors: the closer the personal relationship or incentives to the individual, the greater the chance of changing behavior. A federally-funded program is pretty far from a close relationship or incentive. A good thought experiment would be to think of ways you could persuade people to choose better health *without* a federally-funded program. Just to name a few: an employer’s disease management program, disease treatment advocates (non-profits) and hospital programs. It is surprising what happens when you give people the benefit of the doubt with decision-making, when the incentives are clear. Another thought experiment is to examine the budgets of governmental entities such as CDC to determine if all of their spending is actually beneficial to U.S citizens. I would think someone such as yourself, who looks to provide tools to create “change for good” would not defend bureaucracies that are impediments to change. Maybe some of these tax dollars could be returned to citizens (wealthier people are ususally healthier) or to state governments. Federalism, that’s what Fred is about. Actually, with your interest in social change, encouraging fifty laboratories, the states, may be an innovative approach to solving today’s problems. Please consider supporting FDT. I must take issue with your interpretation of the Constitution. You are correct to say information and motivation are not prohibited in the Constistution. However, nowhere does it say that we should tax U.S. citizens to influence their health decisions of other citizens. Thanks for your thoughful comments. You’re right that behavior change is hard, and it can take a lot of resources. Nonprofits, physicians, family members and others in the private sector definitely have an important role to play. But I feel that the government also has a key role in this particularly because of the need to promote public health, which does not always have private sector players that will step up to the plate. Obviously, there are many places where government spending is wasteful, but that doesn’t mean we should throw the baby out with the bathwater. Social marketing as a means of building awareness of the need for behavior change and directing people to the next step (which, as you say, is most effectively done interpersonally) has been shown to be quite effective. When the government’s efforts are combined with private and nonprofit partnerships, so much the better. But I think the government is in the best position to make sure that health priorities are addressed at the national level. Thanks for your response. I know we are getting a bit afar of Fred Thompson and the public health issue, but I wanted to respond. Can you give examples of where a federal program has provided measurable, positive results? Is a federal program more effective than a state or county effort? Why? In terms of addressing health priorities, with a country the size of ours and the regional differences that result, can the Federal government really do much other than describe broad generalities and goals? This comes back to Mr. Thompson’s federalist approach. I think a more local focus would allow a more customized approach, as well as foster innovative solutions. Since so many government programs take on a status close to eternal life, I think we need to be careful about how much federal spending is added to our budget, in spite of the good intentions behind the program. “Throwing the baby out with the bath water” is an either-or construct that doesn’t address the necessity of placing more accountability on governmental spending. Fred Thompson lays out his approach at http://www.hsgac.senate.gov/vol1.pdf in the document “Government at the Brink.” I feel confident that you would agree that effective government spending on public health issues would provide positive results, as well as ensure the viability of those succcessful programs. 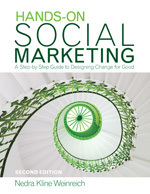 I have requested your social marketing book through our library. Looking forward to reading it and applying your work to building awareness for conservative causes. Thanks for continuing the conversation. There have been many federally funded social marketing programs that have positive evaluation results showing they are effective, such as the Verb campaign, the 5-a-Day campaign, numerous cancer screening programs, the Click it or Ticket campaign and others. In addition to national campaigns, much of the funding for state and local public health efforts comes via grants from various federal agencies. This helps to take care of the concern that different regions have different needs and require alternate approaches from what can be done at a national level. The fact that media campaigns can be quite expensive to develop and produce means that unless an entity with the resources and expertise undertakes that aspect, the smaller local programs simply cannot do it themselves. The resources required to develop campaigns for different ethnic and linguistic groups are also lacking locally. The federal govt is in the best position to develop these campaigns for the local programs to then take and customize for their own populations. And I absolutely agree that the federal programs should need to prove their worth to continue to be funded. Evaluation must be built in to ensure that the people’s tax dollars are not wasted. I hope you find the book helpful. The tools it provides can be used for any type of issue. I wish you success! This blog is really fantastic as I have gone through all the posts. I don’t know why the blog mater is not interested in posting some more relative information. I request the blog mater to add some more content to this great blog. I shall link from my blogs to this blog soon. This website will tell you guide How to Cure HIV by Magneto Homeopathy and Holistic Treatment. Guide claims that HIV viruses can’t be killed but they can be ousted out of the body cells using bio magnetic repulsion or something written. You can verify the guide by downloading that for free. For this site. I dreamt of a HIV free world after reading this guide. Hope that you will add more free information to the comment boxes to let other people read about this interesting subject.